With 11 National Character Areas including the Trent Valley Washlands, Melbourne Parklands and South West Peak, Derbyshire is known for its breath-taking natural beauty. 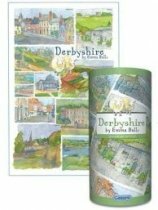 This puzzle features ten different scenes from around the county.There are nine Emma Ball jigsaws in the Gibsons gift range, each of which are presented in smart cardboard tubes. The puzzles contain 250 pieces and depict beautiful scenes from all over Britain. From Cornwall to the Scottish Highlands, each jigsaw is a montage of the natural beauty that can be found in different regions around the UK.